A formal manipulator in mathematics often experiences the discomforting feeling that his pencil surpasses him in intelligence. In An Introduction to the History of Mathematics (1953, 1976), 354. This same idea was said much earlier by Ernst Mach (1893). See the quote that begins, “The mathematician who pursues his studies,” on the Ernst Mach Quotes page on this website. A mathematical science is any body of propositions which is capable of an abstract formulation and arrangement in such a way that every proposition of the set after a certain one is a formal logical consequence of some or all the preceding propositions. Mathematics consists of all such mathematical sciences. In Lectures on Fundamental Concepts of Algebra and Geometry (1911), 222. A research laboratory jealous of its reputation has to develop less formal, more intimate ways of forming a corporate judgment of the work its people do. The best laboratories in university departments are well known for their searching, mutual questioning. In Editorial, 'Is Science Really a Pack of Lies', Nature (1983), 303, 1257. As quoted and cited in Bradley P. Fuhrman, Jerry J. Zimmerman, Pediatric Critical Care (2011). Every mathematical discipline goes through three periods of development: the naive, the formal, and the critical. Quoted in R Remmert, Theory of complex functions (New York, 1989). Formal thought, consciously recognized as such, is the means of all exact knowledge; and a correct understanding of the main formal sciences, Logic and Mathematics, is the proper and only safe foundation for a scientific education. In Number and its Algebra (1896), 134. Hubris is the greatest danger that accompanies formal data analysis, including formalized statistical analysis. The feeling of “Give me (or more likely even, give my assistant) the data, and I will tell you what the real answer is!” is one we must all fight against again and again, and yet again. In 'Sunset Salvo', The American Statistician (Feb 1986), 40, No. 1, 75. Mathematicians can and do fill in gaps, correct errors, and supply more detail and more careful scholarship when they are called on or motivated to do so. Our system is quite good at producing reliable theorems that can be backed up. It’s just that the reliability does not primarily come from mathematicians checking formal arguments; it come from mathematicians thinking carefully and critically about mathematical ideas. Concerning revision of proofs. In 'On Proof and Progress in Mathematics', For the Learning of Mathematics (Feb 1995), 15, No. 1, 33. Reprinted from Bulletin of the American Mathematical Society (1994), 30, No. 2, 170. Mathematics as we practice it is much more formally complete and precise than other sciences, but it is much less formally complete and precise for its content than computer programs. In 'On Proof and Progress in Mathematics', For the Learning of Mathematics (Feb 1995), 15, No. 1, 33. Reprinted from Bulletin of the American Mathematical Society (1994), 30, No. 2, 170. Mathematics in its widest signification is the development of all types of formal, necessary, deductive reasoning. Mathematics will not be properly esteemed in wider circles until more than the a b c of it is taught in the schools, and until the unfortunate impression is gotten rid of that mathematics serves no other purpose in instruction than the formal training of the mind. The aim of mathematics is its content, its form is a secondary consideration and need not necessarily be that historic form which is due to the circumstance that mathematics took permanent shape under the influence of Greek logic. In Die Entivickelung der Mathematik in den letzten Jahrhunderten (1884), 6. People are usually not very good in checking formal correctness of proofs, but they are quite good at detecting potential weaknesses or flaws in proofs. Pure mathematics … reveals itself as nothing but symbolic or formal logic. It is concerned with implications, not applications. On the other hand, natural science, which is empirical and ultimately dependent upon observation and experiment, and therefore incapable of absolute exactness, cannot become strictly mathematical. The certainty of geometry is thus merely the certainty with which conclusions follow from non-contradictory premises. As to whether these conclusions are true of the material world or not, pure mathematics is indifferent. The focal points of our different reflections have been called “science”’ or “art” according to the nature of their “formal” objects, to use the language of logic. If the object leads to action, we give the name of “art” to the compendium of rules governing its use and to their technical order. If the object is merely contemplated under different aspects, the compendium and technical order of the observations concerning this object are called “science.” Thus metaphysics is a science and ethics is an art. The same is true of theology and pyrotechnics. Definition of 'Art', Encyclopédie (1751). Translated by Nelly S. Hoyt and Thomas Cassirer (1965), 4. The mathematician, carried along on his flood of symbols, dealing apparently with purely formal truths, may still reach results of endless importance for our description of the physical universe. In The Grammar of Science (1900), 505. The purely formal sciences, logic and mathematics, deal with such relations which are independent of the definite content, or the substance of the objects, or at least can be. In particular, mathematics involves those relations of objects to each other that involve the concept of size, measure, number. The purely formal Sciences, logic and mathematics, deal with those relations which are, or can be, independent of the particular content or the substance of objects. To mathematics in particular fall those relations between objects which involve the concepts of magnitude, of measure and of number. To the average mathematician who merely wants to know his work is securely based, the most appealing choice is to avoid difficulties by means of Hilbert's program. Here one regards mathematics as a formal game and one is only concerned with the question of consistency ... . The Realist position is probably the one which most mathematicians would prefer to take. It is not until he becomes aware of some of the difficulties in set theory that he would even begin to question it. If these difficulties particularly upset him, he will rush to the shelter of Formalism, while his normal position will be somewhere between the two, trying to enjoy the best of two worlds. In Axiomatic Set Theory (1971), 9-15. In Thomas Tymoczko, New Directions in the Philosophy of Mathematics: an Anthology (), 11-12. 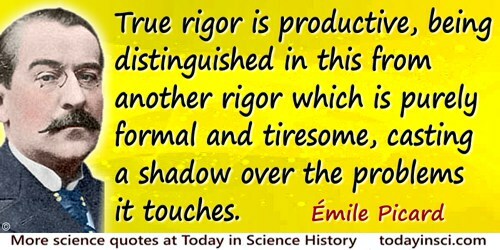 True rigor is productive, being distinguished in this from another rigor which is purely formal and tiresome, casting a shadow over the problems it touches. From address to the section of Algebra and Analysis, International Congress of Arts and Sciences, St. Louis (22 Sep 1904), 'On the Development of Mathematical Analysis and its Relation to Certain Other Sciences,' as translated by M.W. Haskell in Bulletin of the American Mathematical Society (May 1905), 11, 417. We are not very pleased when we are forced to accept a mathematical truth by virtue of a complicated chain of formal conclusions and computations, which we traverse blindly, link by link, feeling our way by touch. We want first an overview of the aim and of the road; we want to understand the idea of the proof, the deeper context. Unterrichtsblätter für Mathematik und Naturwissenschaften (1932), 38, 177-188. As translated by Abe Shenitzer, in 'Part I. Topology and Abstract Algebra as Two Roads of Mathematical Comprehension', The American Mathematical Monthly (May 1995), 102, No. 7, 453. When one considers how hard it is to write a computer program even approaching the intellectual scope of a good paper, and how much greater time and effort have to be put in to make it “almost” formally correct, it is preposterous to claim that mathematics as we practice it is anywhere near formally correct. In 'On Proof and Progress in Mathematics', For the Learning of Mathematics (Feb 1995), 15, No. 1, 33. Reprinted from Bulletin of the American Mathematical Society (1994), 30, No. 2, 170-171. [Aristotle formal logic thus far (1787)] has not been able to advance a single step, and hence is to all appearances closed and completed. … the definition of irrational numbers, on which geometric representations have often had a confusing influence. … I take in my definition a purely formal point of view, calling some given symbols numbers, so that the existence of these numbers is beyond doubt. (1872). As quoted in Ernst Hairer and Gerhard Wanner, Analysis by Its History (2008), 177.